Aloha is a strange bird. From the opening credits laid out over vintage footage from Hawaiian celebrations to the music of Hanohano Hanalei there is a sense of slapdash to it. 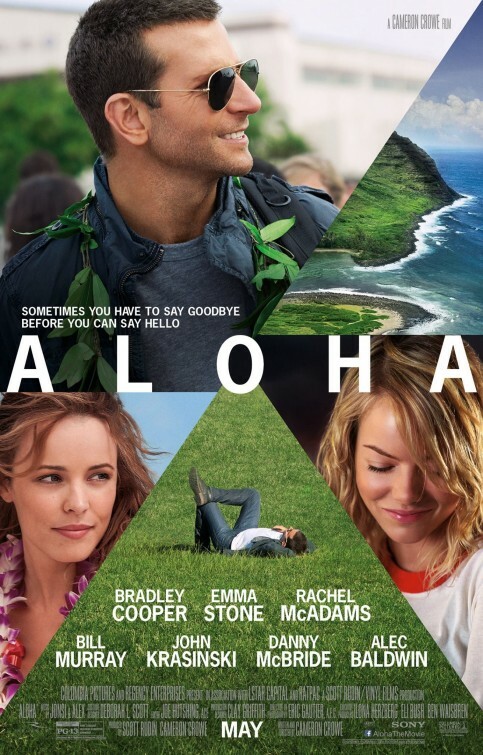 Given this is a Cameron Crowe (Jerry Maguire, Almost Famous) film there is a sense of expectation to it, but more than anything he's done over the past ten years Aloha immediately feels more free-wheeling. From the outset we get the sense not of Crowe's writing style, but more the dedication of the actors to the defining characteristics and personalities of their characters. 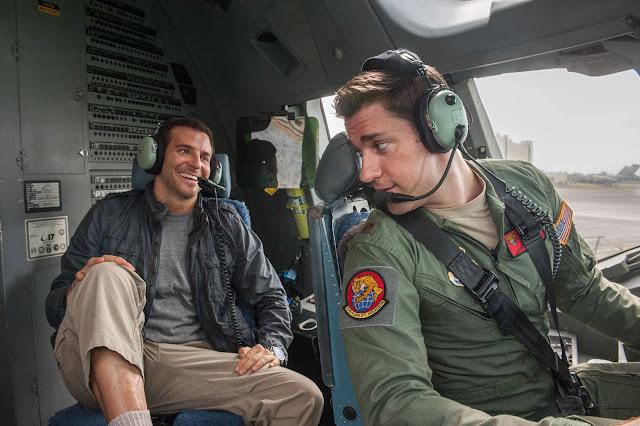 The films lead is entrusted to one of our few bankable movie stars in Bradley Cooper whose Brian Gilcrest was nearly killed in a bombing while serving in Afghanistan and now has trouble with both legs. Gilcrest's jaded and cynical outlook will no doubt serve as the catalyst to be shifted over the course of the film. We are quickly introduced to a roster of familiar faces that are equally defined lending to the thought that this could really be something special. There is Emma Stone's Allison Ng who exudes a hyper-strictness to military conduct while at the same time being blunt, to the point and somewhat over-eager regarding her latest assignment that includes Gilcrest. There is the old flame Gilcrest has tried to forget about since losing her to himself as personified by Rachel McAdams. McAdams ends up coming away with the most emotionally resonant performance of the bunch as it is clear she is anxious to not necessarily reconnect with her former lover, but more get some things off her chest that have been weighing on and need to removed for her to move on. This weight has certainly interfered in her marriage to Woody (John Krasinski) who fully embodies the "strong and silent type". Woody is resistant to change and he knows it, but the time has come to face it when Gilcrest returns to what is Woody's cozy little Mayberry military base in Hawaii. Then you have Bill Murray playing some billionaire technology developer who's looking to buy all he can. Murray is the not-so-wise old man that pretends to have the perspective, but really just has the deep pockets. With all of this going on and all these likable people breathing life into Crowe's quirky dialogue one has to wonder how the film can't at least be appealing or even charming. The fact of the matter is that it actually kind of is despite ever being able to lift the cloud of peculiar that hovers above it. Allison (Emma Stone), Brian (Bradley Cooper) and Tracy (Rachel McAdams) form the basis of a love triangle. The biggest issue hanging over the movie is that the plot is too complicated for the basic message the film is trying to convey. It's almost as if Crowe found the idea of space junk and how it's come to be and what it's doing to our skies so fascinating that he wrote a romantic comedy around it. In the broad sense Aloha is about a military contractor (Cooper) who returns to the site of his greatest career triumphs on a job for the wealthy Carson Welch (Murray) that will have him bargaining with the locals in order to send a satellite into space that may or may not have a last second addition strapped with weapons. There is also something to do with the blessing of a gate, but it is never made exactly clear why this detail is included or what Gilcrest's role in the whole operation is. The real story, outside of all the military mumbo jumbo and top secret verbiage that feels rather amateur and as if Crowe didn't do his homework all that well, is the one where Gilcrest re-connects with his long-ago love, Tracy (McAdams), while unexpectedly falling for Stone's hard-charging Captain yet completely quirky outside of her uniform, Allison. The issue being that the main plot conflict doesn't relate well enough to the heart of the story for there to be a correlation and thus we don't care about it. There is a grand gesture from Gilcrest in the climactic moments of the film that is meant to symbolize his feelings for Ng, but that it occurs in the vein of the main plot essentially renders it ineffective. The gesture is so foreign to any emotional throughline there is no connection that hits us in the heart the way I imagine Crowe intended it to when he picked out the The Blue Nile track to accompany it. In fact, Crowe would have been better off had he simply made a standard rom-com with his keenly observational and perceptive dialogue to elevate it rather than shoe-horning in the space plot. That said, the film is too insightful and aware of actual human emotion for it to be considered downright horrible, but in fact when it focuses on the stronger love story aspects, it shines. Early on in the developing relationship between Brian and Allison, she mentions the word "mana" which, in Hawaiian, means power and spirit. It is looked upon as a spiritual quality which is another talking point considering Crowe also attempts to infuse his script with an undercurrent concerning island myths. This would have been a nicer, more unique correlation to the emotional core than the military aspect, but it feels to tacked on and secondary to the point for its purpose to ever come through fully. With as much going on as Crowe sets up in the first half hour there is still a weirdness to the characters and the scenarios that is difficult to figure out. What might play a part in this inability to adjust to what Crowe is doing is the fact he strips out the cinematic qualities of some of the more intimate moments making them unflattering and intently anti-climactic. Complimenting the loose and free-wheeling tone of the script Crowe has cinematographer Eric Gautier (Into the Wild) shoot the beautiful Hawaiian landscapes predominantly in handheld. It is the dedication of the actors and the strange combinations of chemistry they elicit from Crowe's words that ultimately make something coherent out of the mess of a script he seems to have delivered overall. There are a lot of emotions at play, a lot of unspoken emotions. This is where Crowe shows his strong suit in that he delivers on a set-up that feels natural by giving us a solid pay-off in the end that finally hits the emotional chord he's only been intermittently finding throughout the course of the film. Crowe is good at conclusions. He knows where his characters need to end up and he knows how to paint the loaded picture of that instance, but while he can write how they get there it is his execution of these journeys that can't help but feel muddled. A final shot of Murray's character, for instance, as he stands on the edge of the ocean, staring at the sky (what was almost his, what holds the answer to every question) is nothing short of existential and packed with meaning despite Murray's Welch factoring little into the actual story the film is telling. who is now married to his old girlfriend. That story, in its simplest form, is about second chances. The aforementioned combinations of chemistry delve into this idea best. McAdams and Cooper are at the forefront as the first time we realize the depth of their history and the connection that once existed between them is when Brian comes over to Tracy and Woody's for dinner during his stay in Hawaii. While in the kitchen preparing dinner Tracy is crouched down looking through the fridge when Brian enters. She hasn't seen this man, sans a few minutes upon his initial arrival, for over fifteen years after carrying on a serious relationship with him for multiple years prior. How strange it must be for her to look up and see this same guy, fifteen years removed from the man she once knew so well, now standing in her house as she makes dinner. It is such a purely mundane set of circumstances, but we can see the set of spectacular feelings that are involved. Both she and Woody see nothing but the original owner of her heart and they are forced to ask themselves questions they've been avoiding, but always knew were inevitable. Cooper's Gilcrest is essentially depressed, he missed a chance at something great because he let himself and his selfishness get in the way of it and he knows it. This moment that comes, the one that Tracy has been waiting for, is the wave of significance and the foundation from which we take the most away from Aloha. About an hour into the film it begins to meander a bit, but Murray and Stone use their charm in another combination of charisma to heighten the appealing whimsical approach. People tend to talk about music when discussing Crowe's films and there are some nice choice cuts here, especially in the middle section of the film at a holiday party where The Gap Band, Tears for Fears and Hall & Oates are all used to bring an atmosphere the film should have carried throughout. The aforementioned Blue Nile track does nothing but really compliment the deflating nature of the narrative during its climax and a sequence where Vancouver Sleep Clinic's "Vapour" is used feels like Crowe knew that to use Bon Iver was already so banal that he opted for these guys instead. A track titled "Always Gold" by Radical Face was rather inspiring though and is worth giving a listen if you're into Crowe's typically strong soundtracks. I say a lot about Crowe's writing here while being somewhat dismissive, but I realize the measure of thought that has gone into crafting his dialogue and I even appreciate his effort to bring a fresh aspect to what might have otherwise been perceived as a typical love triangle story. The ideas he touches upon about nothing being sacred and our relationship with emotion as compared to the mentality of the real world where everything is about money and sales is striking and worth noting. That despite the logistics of real-world rules and necessities there is a greater emotional need that overrides it all and when Cooper lets out a line as simple as, "I need you to believe in me," or McAdams gasps through tear-filled eyes that, "anywhere you turn, someones heart breaks," we understand the moments Crowe is attempting to capture and if we look past everything else he's putting in his own way, we can still feel the earnest attempt at raw human emotion and not the schmaltzy attitude the marketing has proclaimed this to be.